I've been tattooed since I was 16. That was 1989! They're a part of me like my hair and my eyelids. There are three that I show off all the time. Their meanings are below. Almost all of my tattoos, both old and new, were done by Patrick Sans of Burly Fish Tattoo in Flagstaff, AZ. 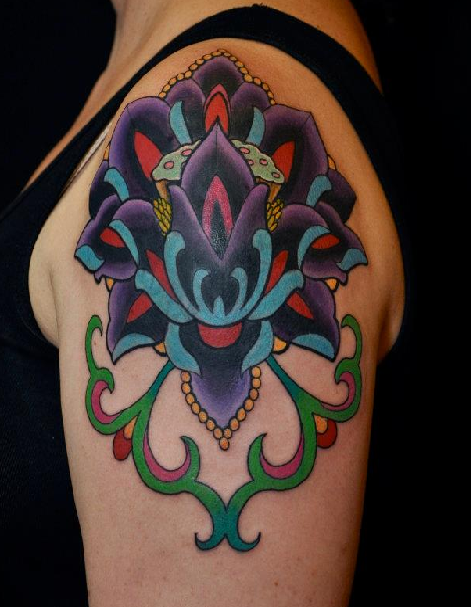 This is a stylized lotus, a flower which has long symbolized enlightenment in Eastern traditions. It is mostly purple, which is the color that represents enlightenment. Plus, it had to be really dark because it's a cover up. I especially love the stamen in the center because they look like a cupcake! The symbol in the middle is Om in the south Indian Tamil script. 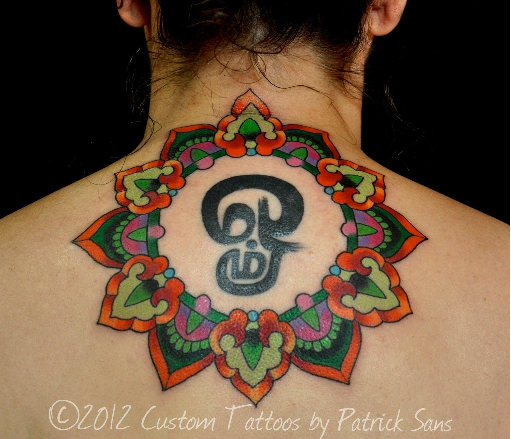 At one point I was adamant that I wouldn't get any kind of yoga tattoo, and especially not an Om. Then, while I was working through Georg and Brenda Feuerstein's 800 hour course on the History and Philosophy of Yoga I turned the page and there was this symbol. I knew it was my next tattoo. Georg passed away a few months later. I got this in his memory. It was originally done by Mike Towles at 12th Planet Tattoo Company in Sierra Vista, Arizona. The mandala has 12 petals, like the heart chakra mandala. They alternate being more symbolically flame and leaf, tying together the flower on one shoulder with the circle of fire on the other. The colors are green, the color of the heart chakra, and red, the color traditionally associated with love in our culture. 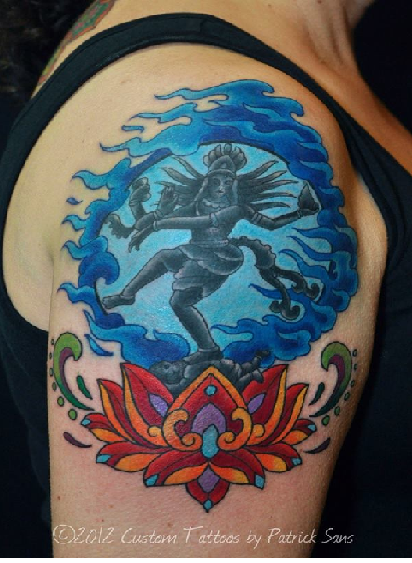 And this is Shiva, Lord of Destruction, Transformation, and Yoga. See below for the story behind this particular image of Shiva Nataraja. A group of priests was performing a fire ceremony (yagna) in a forest when Shiva walked past naked. Shiva, engulfed in bliss, was totally oblivious of them. The priests, however, were distracted by him and held him responsible for the distraction. They were afraid of him. Here was a man who was so content and blissful, he did not need all the things they were performing their ceremony hoping to get. He did not seek wealth; he did not seek knowledge; he did not seek power. He was completely content. They became unsure of themselves, and they felt their wives would leave them and chase Shiva. Using their knowledge of yagna, they invoked creatures from the fire and unleashed them against Shiva. First came the tiger, then a serpent, and finally a demon. Shiva was fearless. He caught the tiger by its jaw, skinned it alive and wrapped its hide, dripping with blood, around his body. Then he picked up the snake and put it around his neck. It sat there, still, with its hood flared open. Finally, Shiva jumped on the back of the demon, breaking its back. Then Shiva danced, standing on the back of the demon. The only music was his rattle-drum. At first the priests were terrified. They realized this was no ordinary man. Their fear turned to awe as the performance continued. It was mesmerizing! Shiva’s hands, feet, and body moved gracefully, in perfect coordination. His whole form seemed to expand. The ends of his dreadlocks rose up to touch the sky. The stars and planets stopped to watch. The tips of his fingers grazed the horizons where the gods assembled, spellbound. The force of each footfall forced the demons and serpents to rise from their subterranean kingdoms. Such a performance had never been seen before. Shiva struck a whole series of poses in order to communicate. This was not entertainment. This was enlightenment. This was the Ananda-Tandava, the dance of bliss. Finally, he froze. This final pose contained the wisdom of the Vedas. What had not been realized by the priests after performing hundreds of rituals was realized by that one dance pose. His right palm was upraised in abhaya mudra, meaning, do not fear. His left palm was down, in a gesture of grace. The left foot is circling precariously in space, moving toward the right which symbolizes the path of the seeker, from the material to the Sacred. The wheel of fire in which he dances represent the cycle of birth, life, death, and rebirth (samsara). The demon under foot represents ignorance. Shiva holds him down so we might remember who we really are.